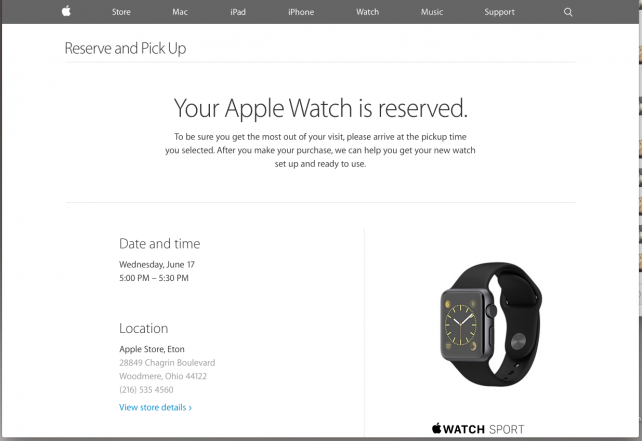 How can I reserve my Apple Watch for in-store pickup? 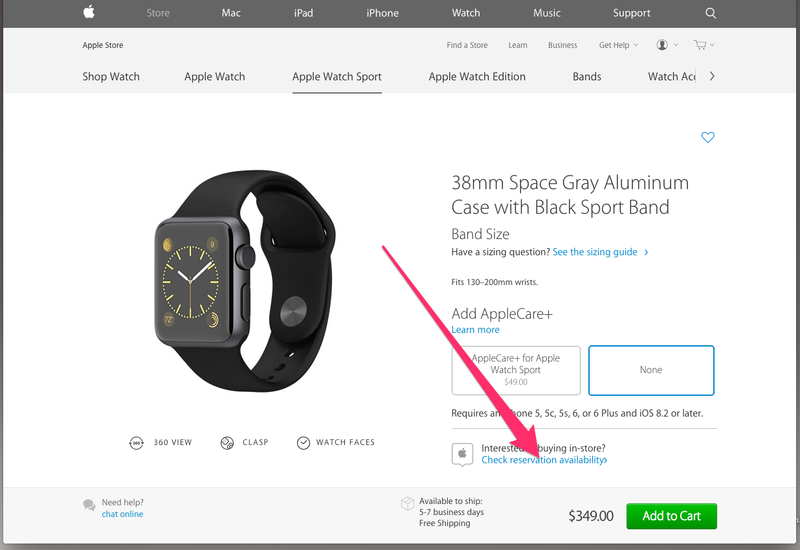 If you haven’t ordered an Apple Watch yet because you were waiting for availability of the wearable device in retail stores, your wait may be over. 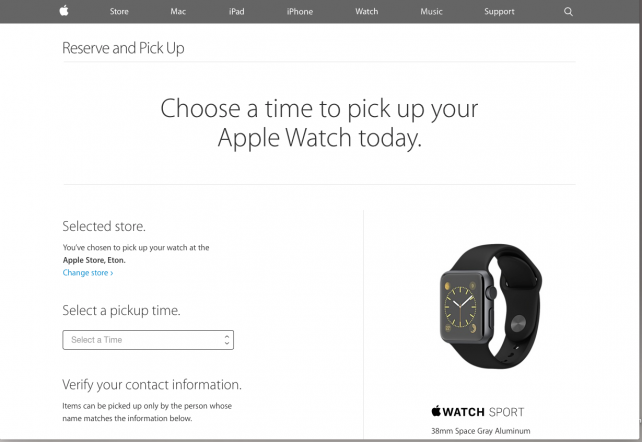 Apple Stores across the U.S., U.K., and Australia have begun receiving shipments of the smartwatch, and the online reservation and pickup system has been enabled. So, how do you go about reserving your Apple Watch for in-store pickup? Let’s go through it step by step. We start with Apple’s Web page, as seen above. Once you see the Apple Watch, click on it to go to the page for the smartwatch. 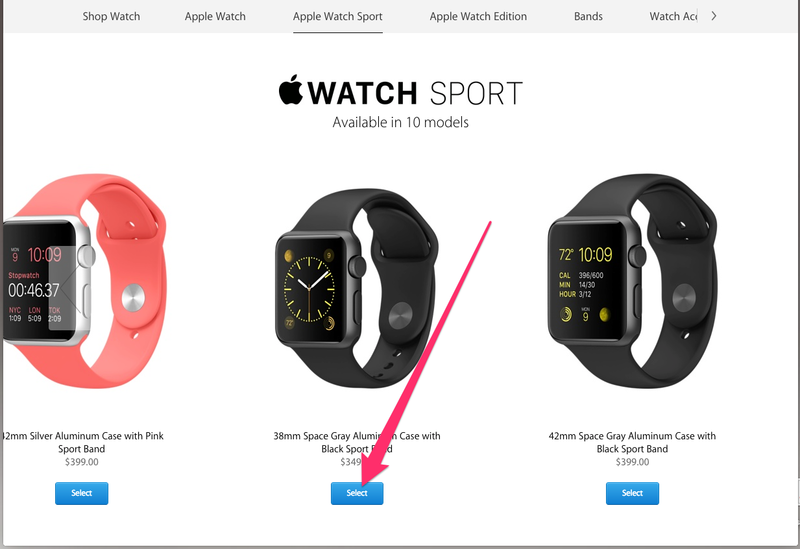 Once there, you should see a “Buy Now” button in the top right corner, as shown in the image below. This will take you to the page where you select which Apple Watch you want to buy. 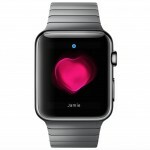 For our purposes, we are choosing to view models and pricing for the Apple Watch Sport. Click the link, as shown below, and off you go. If you want to bypass the previous steps, just click this link to go straight to the Web page you see below. Next, you’ll choose which Apple Watch Sport you want to buy. I like black and have small wrists, so I’m going with the 38mm Space Gray Aluminum Case with Black Sport Band, as you can see below. Now, I get to the Web page that tells me the shipping time for the Apple Watch I’ve selected, five to seven business days. I also see a new option, “Check reservation availability,” as you can see the red arrow pointing to in the image below. I need to click that link, because I don’t want to wait for shipping. 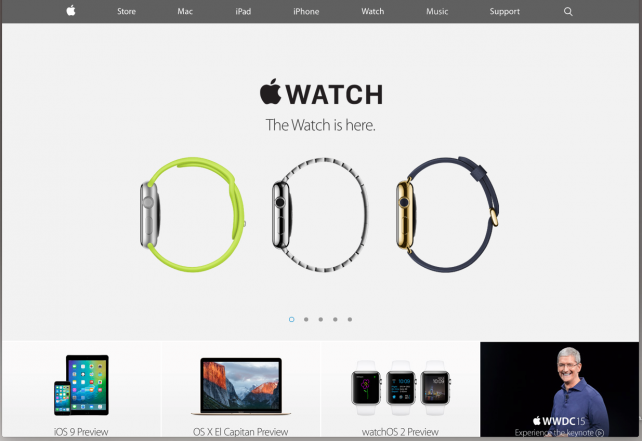 On the next page, you’ll choose your state and store. 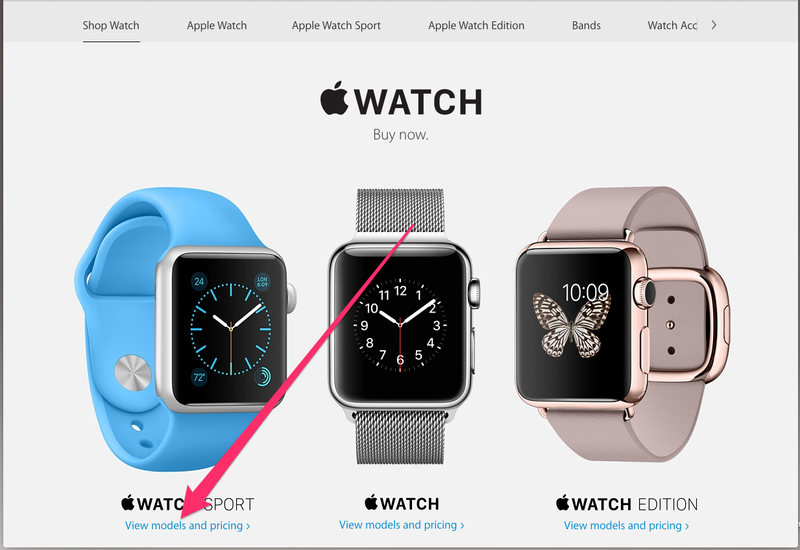 If a state name is grayed out, there are no stores there with available stock of your chosen Apple Watch. As you can see, though, the store I’ve selected has the black Apple Watch Sport, and has reservations available at 11:00 a.m. Next, I’ll click the blue button to sign in with my Apple ID. Coming up next, I need to sign in with my Apple ID and enter a series of letters and numbers to prove I’m a human. Once done, I click Continue to proceed to the next step. 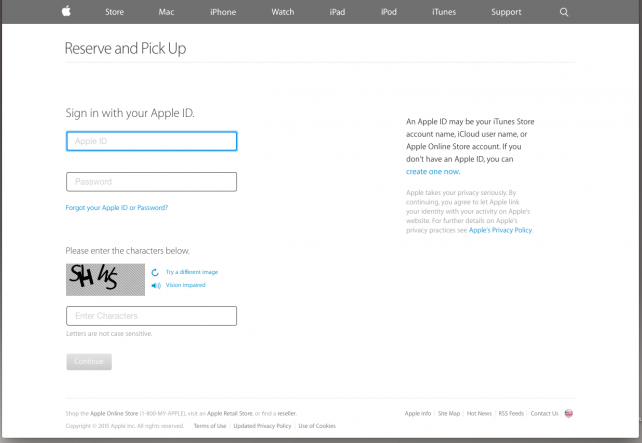 Once I’ve signed in with my Apple ID, I need to request and verify a registration code. To do that, I text a string from the Web page to the number listed, and wait for a registration code to come back to my iPhone. 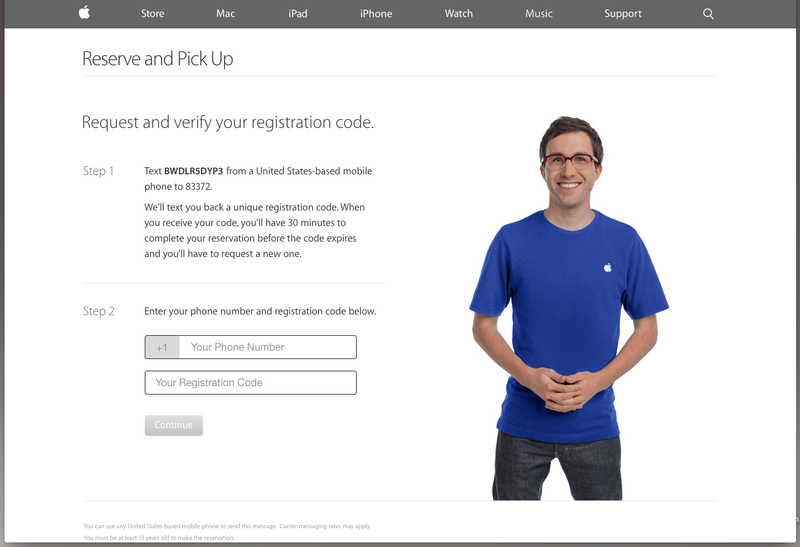 Once I receive that code, I enter my phone number and registration code, then click Continue. 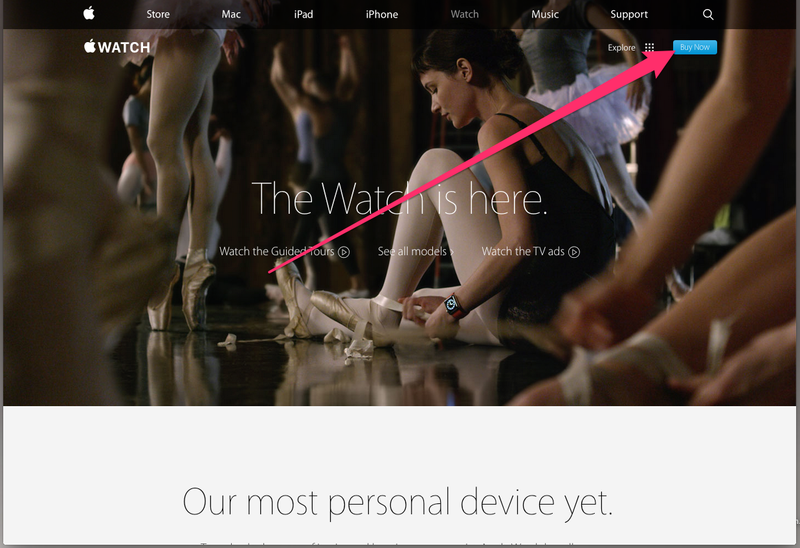 After this, you should see a screen that says your Apple Watch is reserved. The date and time will be confirmed for you, along with the location. You should also receive an email confirmation of your reservation. That’s all it takes. You should note, though, that once you make your reservation online, it cannot be changed or canceled. If you are late for your reservation time, you may find yourself having to make a new appointment. 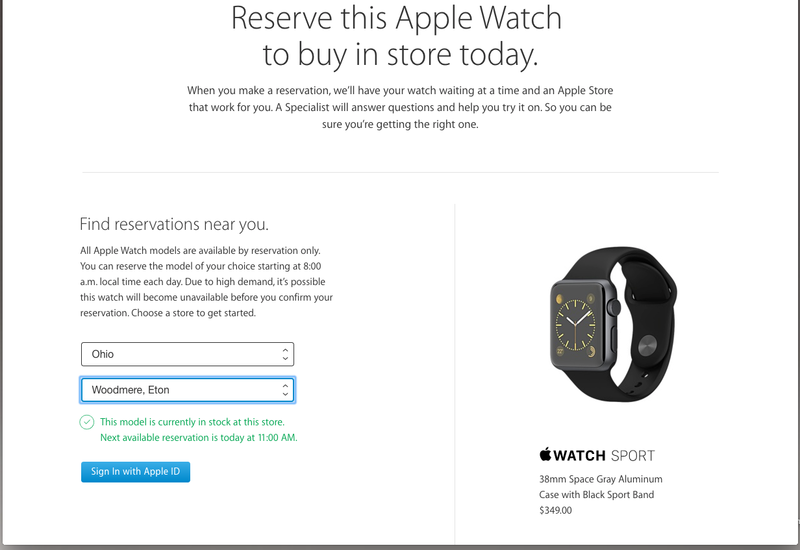 Since Apple limits people to one reservation per Apple ID per day, that might mean waiting until the following day. If you change your mind about which model you want, you can ask a Specialist about other available combinations, but some of them might not be there. When you go for your appointment, you need to take with you a valid photo ID that matches the first and last name on your reservation, along with your preferred form of payment and your iPhone. 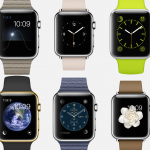 Does the Apple Watch Sport offer users the best display?